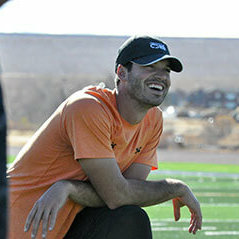 Coach Jenkins founded Jenkins Athletics LLC in 2013 with the mission of training quarterbacks and never looked back. Since 2013 he has worked with well over 200 quarterbacks across the country, helped quarterbacks land college scholarships, and prepped college seniors for the NFL and CFL. 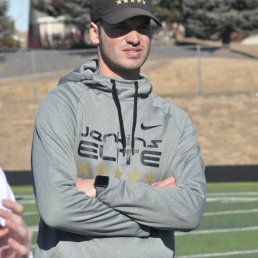 Tim Jenkins founded Jenkins Elite in 2013 and since has worked with over 200 quarterbacks across the country and counting. He has helped mentor 7 elite 11 regional invitees and 5 top gun FBU QB’s. He has also helped place college seniors in both the NFL and CFL through pre-draft preparation and training. Tim Jenkins signed a contract with the Calgary Stampeders in October 2013. Working with the team throughout the end of the regular season and into the playoff run during the CFL expanded roster period. Tim Jenkins signed a contract with the St. Louis Rams May 13th, 2013 after a successful minicamp tryout with the Rams. Participated in OTA’s and Training camp with the St. Louis Rams in 2013. Following training camp, Tim was let go after having a 95.8 Quarterback rating throughout the pre-season. 4 year starting quarterback and team captain at Fort Lewis College. Setting or sharing 18 records in his career. Also amassing 8,968 passing yards and 60 total touchdowns in his career. Finishing with 2 RMAC offensive player of the week awards, 1 NFF offensive player of the week award, the RMAC freshman of the year award, 2nd team all RMAC honor, Fort Lewis College MVP award, 5 All-Star game invites including the division 1 Casino Del Sol All Star Game, as well as pro day at Colorado State University, and securing an invite to the NFL Super Regional Combine in Dallas, Texas. Was selected as 1st team all-southern league 5A quarterback in 2008. Led ThunderRidge to a perfect 9-0 regular season record and southern league championship in their first year of 5A football. Finishing his career owning 7 records at ThunderRidge.